MAVEN, NASA's next spacecraft launching to the Red Planet in barely three days time on November 18th, seeks to unlock one of the greatest Martian mysteries: Where did all the water go? Above: Inside the Payload Hazardous Servicing Facility at NASA's Kennedy Space Center in Florida, engineers and technicians prepare the MAVEN spacecraft for encapsulation inside its payload fairing. Credit: NASA/Kim Shiflett. From the accumulated evidence so far scientists believe that billions of years ago, Mars was gifted with a thick atmosphere like Earth and liquid water flowed across the surface. The Red Planet was far bluer, warmer, wetter and hospitable to life four billion years ago – truly a lot more Earth-like. And then Mars lost its atmosphere starting somewhere around 3.5 to 3.7 Billion years ago. As the atmosphere thinned and the pressure decreased, the water evaporated and Mars evolved into the cold arid world we know today. But why and exactly when did Mars undergo such a radical climatic transformation? "Where did the water go and where did the carbon dioxide go from the early atmosphere? What were the mechanisms?" asks Bruce Jakosky, MAVEN's Principal Investigator from the University of Colorado at Boulder. MAVEN is NASA's next Mars orbiter and is due to blastoff on Nov. 18 from Cape Canaveral, Florida. It will study the evolution of the Red Planet's atmosphere and climate. Universe Today visited MAVEN inside the clean room at the Kennedy Space Center. With solar panels unfurled, this is exactly how MAVEN looks when flying through space and circling Mars. Credit: Ken Kremer/kenkremer.com. Although there are lots of theories, NASA's MAVEN Mars orbiter – which stands for Mars Atmosphere and Volatile Evolution – is the first real attempt to investigating these fundamental questions that hold the key to solving the Martian mysteries perplexing the science community. "We don't know the driver of the change," explains Jakosky. "The major questions about the history of Mars center on the history of its climate and atmosphere and how that's influenced the surface, geology and the possibility for life," says Jakosky. MAVEN is equipped with three instrument suites holding nine science instruments. MAVEN will focus on understanding the history of the atmosphere, how the climate has changed through time, and how that influenced the evolution of the surface and the potential for habitability by microbes on Mars. I personally inspected MAVEN inside the clean room at the Kennedy Space Center on September 27th with fellow journalists when the solar arrays were fully unfurled. The probe spanned 37 feet in length from wingtip to wingtip. Since then, MAVEN has been folded and encapsulated inside the payload fairing, transported to the pad at Launch Complex 41 and hoisted on top of the Atlas V rocket on Cape Canaveral Air Force Station (CCAFS) in Florida. 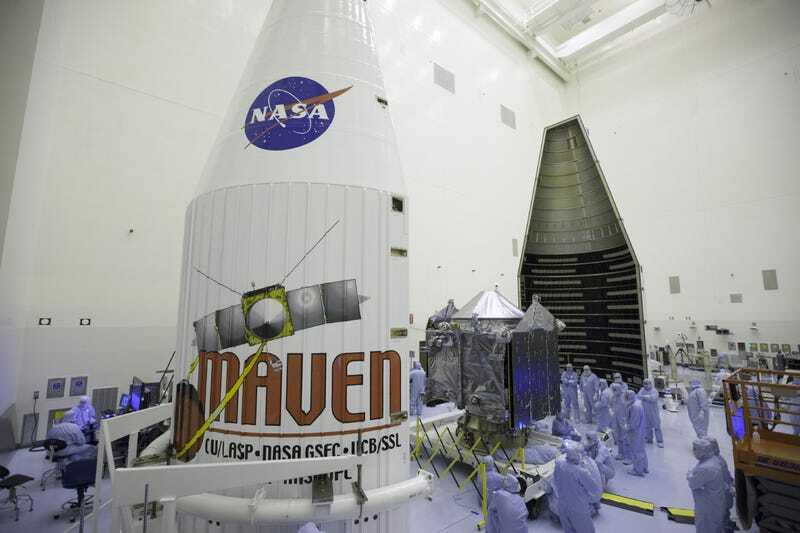 The $671 Million MAVEN spacecraft has been powered on and awaits liftoff. MAVEN is the second of two Mars bound probes launching from Earth this November. India's Mars Orbiter Mission (MOM) spacecraft staged a spectacular lift-off from the Indian spaceport on November 5th. Both probes are due to arrive at the Red Planet in September 2014. Stay tuned here for continuing MAVEN and MOM news and Ken's MAVEN launch reports from on site at the Kennedy Space Center press site. This post originally appeared at Universe Today. It has been republished with permission.